This meet will have a remote registration and a remote start. Plan an extra 30 minutes to get there from the parking lot. Camp River Ranch is a pet free zone Do not bring your dog (or other animal) to this meet. Perhaps, think about bringing an extra pair of socks. Shoes are not allowed in the lodge. Winter League is the Pacific Northwest’s premier competitive orienteering series for all ages. Elementary, Middle School, and High School students compete under the banner of the Washington Interscholastic Orienteering League (WIOL). Cascade Orienteering Club also offers a competitive league for college students and adults, as well as non-competitive beginner-friendly categories at every event! As of Monday, Camp River Ranch still had about 2 to 4 inches of snow on the ground across the camp, and there is plenty of new downfall in places that will slow travel both on and off trail. Trails are generally easy to follow, but flagging has been added in some places where the trail is obscured by new downfall. The Terrain at Camp River Ranch is typical for western Washington: trails crisscrossing forested hills, with undergrowth that varies from open woods to thick “fight”. This is a girl scout camp, so cabin clusters and other infrastructure dot the venue, allowing for courses that quickly shift tempo between long off-trail navigation legs and quick technical legs in feature-rich areas. You’ll have to use a wide range of skills to be successful here – flowing through controls on short legs, navigating well off trail using contours to keep track of your location, and making the best decision for you to execute each leg well. Watch out for elevation changes when you’re making a decision about going straight or around. All courses other than Beginner/Elementary/White should expect to go off trail. Full leg cover is recommended, although not required. Expect to get your feet wet with all the snow, and remember that you don’t know what is under the snow – it could be a depression! Have good attack points when you leave the trail, and use your compass and terrain features around you to keep on track. With the recent storm, there will be some new un-mapped stumps and rootstocks, so precision compass skills and pace counting will be your friend to find the mapped feature. All courses will run through the girl scout camp challenge course area. There are “No Trespassing” signs up in this area. You may enter, but do not touch any of the equipment, and keep your head up to watch for cables between trees just off the trails. Long Advanced (and on the full-length courses, Short Advanced, and Varsity) will encounter a trail at a junction with a yellow chain across it marking the boundary between Camp River Ranch and a State of Washington property. This is *not* out of bounds, you may go under/around the chains. The map uses what we like to call “Western Washington White” – there are some sections of truly open forest, but most white on the map will have about 50% groundcover with sword fern. The lightest green is more dense sword fern that may look thick, but is runnable as there is no other groundcover to negotiate. Medium green starts to see more deadfall, vine maple, and other less friendly brush (including some holly and blackberry) that will slow you down. Dark green should generally be avoided. Either version of these courses will challenge you to find creative routes and use all the skills in your orienteering toolkit to navigate this classic western Washington terrain. We hope you enjoy the courses! Why is there a start window? This event uses an interval start, which means that participants are started in waves instead of all at once. When you arrive at the start tent, find the chute for your course and follow the start volunteer’s instructions. WIOL Admin Fee (once per season): $5 before October 13, $15 after. Subtract $10 from the season pass if you own your own e-punch. Get one event free if you pre-register for the entire season. 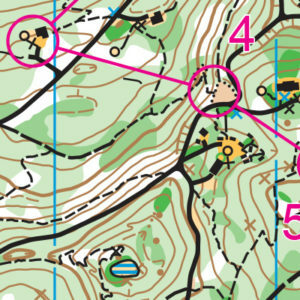 Orienteering uses RFID-like technology known as e-punch to record your race. At the start, finish, and each control, you’ll dip the e-punch into an electronic box, which will beep and flash as confirmation. At the finish tent, download your e-punch to get your results (and let us know you’ve returned safely), then compare your splits and discuss your routes with other finishers! You can rent an e-punch from Cascade OC , or buy your own from Wildwood Adventure Outfitters. Students with a season pass, use the button above to RSVP for this meet by Tuesday February 19 at Noon. Online pre-registration closes Thursday February 21 at 9pm. Day-of-event registration is by cash or check only. Will be in the various lots at Remlinger Farms (Fingers crossed the snow is removed by Saturday). PLEASE DO NOT BLOCK ANY HOUSE DRIVEWAYS!